Yes, Omar, I would be delighted to elaborate. Thank you for asking. Not only is that assertion untrue, but it has been repeated ad nauseum for two hundred and thirty-six years without any effort by claimants to ascertain what “proponents of work-sharing” (etc.) actually believe. Not only is the claim unfounded, but it has been refuted half a dozen times or more by notable economists. Those rebuttals have never been addressed by the antagonists who repeat and repeat the fixed amount of work mantra. Not only is the claim untrue and unfounded, but it is rote — a monotonous, mechanical repetition of the same catchwords and phrases that have been recited a thousand time over the span of more than two centuries. As a counter-example, consider for a moment John Ramsay McCulloch’s 1827 homage to Dorning Rasbotham’s tirade about the “certain quantity of labour to be performed”: “There is, in fact, no idea so groundless and absurd, as that which supposes that an increased facility of production can under any circumstances be injurious to the labourers.” McCulloch refused to admit any conditions under which his opponent’s position might be valid. He scorned that position as groundless and absurd — more groundless and absurd, in fact, than any other idea! You observe that some proponents of work-sharing reckon as if the amount of work to be done is unchanging. That is, they figure that if there are now 320 people employed for 40 hours a week and 80 unemployed, then all 400 will be employed if the hours are reduced to 32. This is a mechanical calculation and overlooks the fact that changes in hours and employment levels will result in changes in labor costs and productivity. These latter changes will affect product prices and consequently consumer demand and the quantity of work required to meet that demand. It is indeed true that some proponents of work-sharing offer calculations based on a mechanical substitution of numbers of workers (n) for hours (h) on the assumption that n*h = some constant — all other things being equal — and appear to forget that all other things are not equal. I share with you a suspicion of mechanical calculations based on spurious ceteris paribus assumptions. These can be misleading guides to policy formulation and can potentially lead to results that are contrary to those that were intended. Presumably, the lessons taught in economics about the “fixed amount of work” were intended to impress upon students the importance of thinking through a problem to its realistic conclusion, rather than jumping to conclusions based on mechanical manipulation of a few isolated variables. 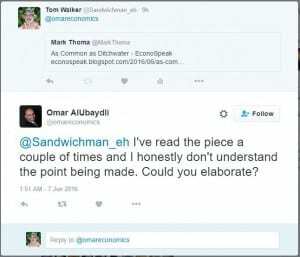 Is that a satisfactory statement of your position, Omar? If so, would you now be able and willing to state your opponents’ position to the opponents’ satisfaction? Let me make that task* a bit more specific, though. There are two arguments for work-time reduction, put forward, respectively, by Arthur Cecil Pigou and Maurice Dobb, that do not rely on a mechanical, fixed amount of work calculation and thus refute the view that proponents of work-sharing necessarily assume that there is a fixed amount of work. Pigou contended that reduction of the hours of work would increase employment to the extent that additional leisure time makes workers more efficient. Dobb maintained that it was not aggregate wages that workers were interested in but wages in proportion to the amount of effort expended. Thus the limitation of working time might increase relative wages regardless of whether it increased or decreased aggregate output and total wages. The two arguments are not mutually exclusive. I have appended the pertinent excerpts from Pigou and Dobb below. It would, however, be unwarrantable to conclude that, because the reasons which popular thought offers in defence of any thesis are invalid, therefore, that thesis is untrue. If it were a good ground for rejecting an opinion that many persons entertain it for bad reasons, there would, alas, be few current beliefs left standing! As a matter of fact, however, conclusions are often right when the reasons adduced by their supporters are ridiculously wrong. It is not undesirable to walk under a builder’s ladder because to do so is, in some magical manner, “unlucky”; but those who dislike the impact of accidentally descending bricks will, nevertheless, do wisely to refrain. Indeed, the reasoning process, which seeks to rebut a conclusion merely by disproving the cogency of a particular argument used in its support, itself involves a fallacy to which logicians have given a name — the fallacy ignoratio elenchi. We are not, therefore, entitled to cut short our inquiry concerning unemployment and the fixed work-fund at the point reached so far. It is still necessary to inquire by direct study whether the extra employment, which would be made available in a particular trade by cutting off the competition of foreigners or prisoners in respect of that trade, would be net extra employment, or would be balanced by a corresponding loss of employment in other industries. The ineffectiveness of the reasoning we have hitherto been reviewing is easily explained. That reasoning fails to penetrate beneath the surface of appearance to the essential under-lying causes. Economists, however, are acquainted with a more adequate analysis. Let us take the point of view of those workpeople in the country who are unemployed, and for whom it is contended that the exclusion of competing imports, the prohibition of prison-labour and the reduction of the normal hours of work would create employment. Why are these people unemployed? They are unemployed because, at the wage they ask, there is no demand for their services, and, unless the wage they ask is lowered, they can only cease to be unemployed if such a demand comes into being. But whence can such a demand come? It can only come from the general income of the country, that is to say, from the product of the labour and capital of the rest of the community. It follows that the exclusion of competing imports, the prohibition of prison-labour and the reduction of the normal hours of work can create employment for them on one condition and on one condition only; namely, that these devices succeed in rendering the labour and capital of the rest of the community more effective in production. The prohibition of prison-labour is certain not to do this, and must necessarily have the opposite effect. The reduction of the normal hours of work will do it or will fail to do it, according as the extra leisure increases the workers’ efficiency more or less than in proportion to the reduction of hours. When in reply to the economists’ theory that wages were inexorably determined by supply and demand, the trade unionists of the middle nineteenth century declared that they would influence wages by limiting the supply of labour through restrictions on working overtime etc., the economists retorted by accusing them of harbouring a fallacious “Work-Fund” doctrine—of thinking that by limiting the work done by each more employment could be created for others. The retort partly missed the point of the argument in so far as the trade unionists were trying to raise the supply-price of their labour by limiting its amount. But at the same time the economists’ ignoratio elenchi contained a point of its own that was important. What they intended to say was that a restriction on the supply of labour could not increase aggregate earnings, and, unless it took the form of restriction of the numbers of the working population, could not increase aggregate earnings per head. This follows if the demand for labour, or the Wages-Fund, is elastic—if it is larger when there is more profit to be made than when there is less. Such restriction can, however, increase wages in proportion to the worker’s expenditure of energy and his “wear and tear,” and it can increase Relative Wages, or wages as a proportion of the total social income. The same applies to modern trade union methods of collective bargaining, which aim, not primarily at restricting the supply of labour, but at raising the supply-price of labour and setting a minimum below which labour cannot be purchased. Such action has quite a wide power of influencing the rate of wages that is paid in proportion to the amount of work that is done, and so of increasing welfare. But, while it can do this, it is unlikely to add to aggregate earnings; and if trade union action goes beyond the attempt to raise the wages of particular grades or particularly exploited groups in special circumstances, it is likely to result in unemployment. What was implied in the economists’ retort to the advocates of the so-called Work-Fund leads to the apparent paradox that the more the workers allow themselves to be exploited, the more their aggregate earnings will increase (at least in the long run), even if the result is for the earnings of the propertied class to increase still faster. And on this base is erected a doctrine of social harmony between the classes. But it does not follow that the workers will prefer to be exploited to a maximum degree, or that attempts to limit this exploitation are based on fallacious reasoning. And if in raising the supply-price of their labour the choice lies between restricting the number of men employed or of restricting the amount of work done by each man, the latter seems clearly the preferable alternative. That “worksharing” seems to account for the employment “growth” last month — Population up 205k, Workforce down 458k, Total Employed up 26k, employed part-time up 605k, employed full-time down 579k. More than half a million full-time jobs GONE!? That’s not job growth, that’s Division of Labor.